Speaking at an economic forum in his home town of St. Petersburg, Putin announced that Russian attitudes on free enterprise are evolving. Shortly after his return from Mexico from the G 20 summit, Russian president Vladimir Putin presided over the opening of the St. Petersburg International Economic Forum (SPIEF). This was a way for Putin to signal that the old global architecture will be increasingly supplanted by new organizations - unless the new players were given greater influence in international economics. For example, the BRICS countries (Brazil, Russia, India, China and South Africa) were willing to pump in $75 billion to the IMF, but expected greater voting rights. He also effectively blamed the United States for the global economic crisis, whose roots are "the petty populism of the politicians and the unrestrained fiscal speculation" that had manifested itself in the US. The Russian president claimed that he wanted to make his country more business friendly. He expressed confidence that, thanks to a government in whiich the people have confidence (namely his own), the Russian prejudice against free enterprise, hardened after the collapse of the Soviet Union and the enrichment of a few well-placed individuals, was now weakening. Putin appointed Boris Titov, a business lobbyist, as ombudsman for entrepreneurs' rights in Russia, to emphasize that the regime will protect free enterprise. "This situation must somehow be changed. The vast majority of citizens must understand with their heart, soul and mind that a country’s locomotive is private initiative." Business has been deterred by the lack of transparency and the absence of legal safeguards in Russia. Putin, a big believer in the Chinese mode,l apparently thinks that he can replicate that Chinese model in Russia and make Russia business-friendly without releasing his hold on political power. 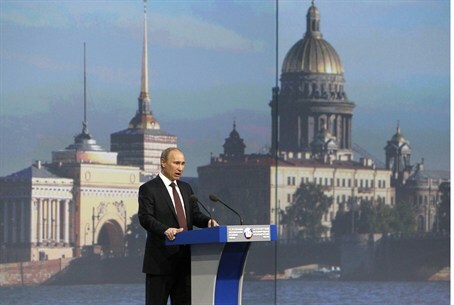 Another important announcement at the forum was that Russia intended to cap oil prices in drawing up its budget. The years of increasing oil prices have made Russian legislators profligate in their spending and have further accentuated the fact that Russia is too dependent on oil exports. Putin is undoubtedly looking over his shoulder at the increasing development of shale oil and the fact that the US will soon be energy independent, releasing the huge quantities that it had to import in the past onto the world market. The new budget rules will help wean Russia off its current petroleum-based economy.